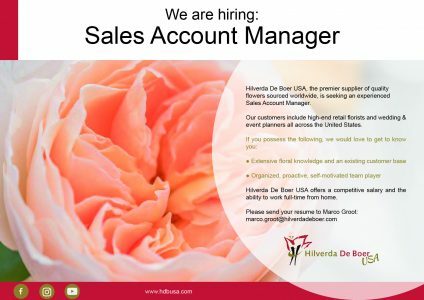 Hilverda De Boer USA, the premier supplier of quality flowers sourced worldwide, is seeking an experienced Sales Account Manager. Our customers include high-end retail florists and wedding & event planners all across the United States. Hilverda De Boer USA offers a competitive salary and the ability to work full-time from home.